We are overwhelmed with gratitude. Our 10th annual Sunday Supper was our best yet, and we couldn’t have done it without all of you! It takes a village to put on CUESA’s biggest fundraiser of the year. 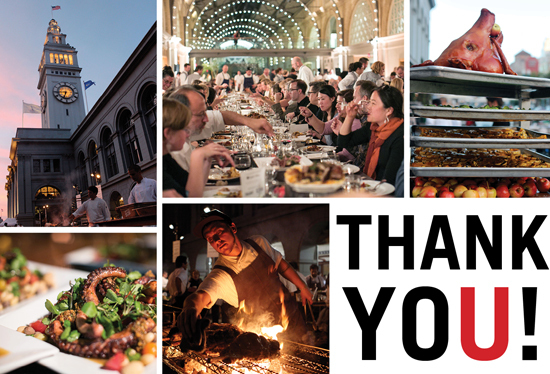 Thank you to everyone who gave so generously to CUESA, including our sponsors, auction winners and attendees. We raised $106,500! Proceeds from the event will support CUESA’s education programs, including free Market to Table cooking demonstrations, low-cost kitchen skill-building classes, farm tours, and scholarships that help farmers make their business more sustainable. And $12,000 was generated specifically for our Schoolyard to Market youth gardening and entrepreneurship program. We would like to extend special thanks to our community of chefs, winemakers, and brewers who are dedicated supporters of our organization and who devote countless hours to creating the best culinary event in San Francisco year after year. And thanks to our faithful CUESA volunteers who help make these events run smoothly. Please save the date for next year: our 11th annual Sunday Supper will be October 20, 2013! 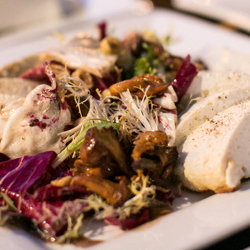 Lauren Kiino of Il Cane Rosso shares a recipe for her delicious Baked Sheep’s Milk Ricotta with Radicchio, Chanterelle & Hazelnut Salad, which was served at Sunday Supper. Visit our Facebook page for photos from the event. Please tag yourself and your friends, and share! Thank you to Drew Altizer Photography and Tory Putnam for capturing the magic of the evening. To see additional images from the event and purchase prints, click here.